I have heard of virtual keyboards, but I had never seen one in action before. 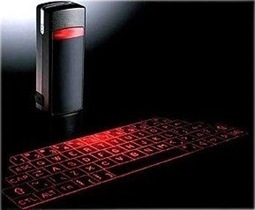 This virtual keyboard is the i-Tech Virtual Bluetooth Wireless Laser Keyboard for PDA/Smartphone . It uses light to create an image of a keyboard on any flat surface. The unit is quite small (about the size of a matchbook), much smaller than the picture makes it seem. To me, it also looked much stranger in person than the picture indicates. The person I saw using it seemed to be typing at a decent speed. I think it must be an acquired taste because I like travel on my keys. Still, the i-Tech must be the most compact portable keyboard possible. i think it is a good product, but could you tell me more about who is the creator and when it has been created? thank you. Sorry, but I don’t know any details beyond what I was told and the information on the product page on Amazon. But it certainly looked like a neat device, and I think it is safe to say that it would attract a crowd wherever it was used.